When I first sunk my toes into the sand, a thought popped into my head: “This isn’t what I thought it’d be.” And when a swimmer came out of the water and, in passing, warned me about the rocks, I thought: “Maybe this was a mistake.” No, my initial thoughts about Pirate Cove (and Bahìa Drake) wasn’t that it was a tropical paradise. But after a few days there, I realized that ruggedness was just what I desired. 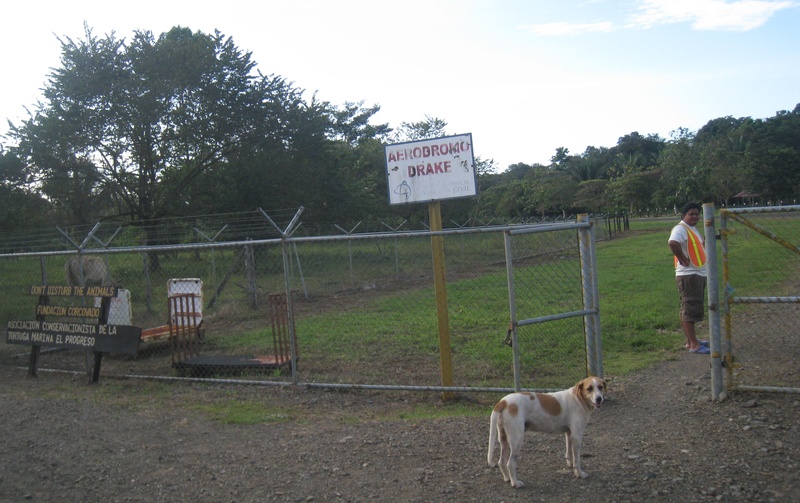 And thus, my three-day stay at Bahìa Drake turned into an eight-day adventure to kick-off my first foray into the wonderful Costa Rica. It was the best part of my trip. Had I been more astute, I would have realized that the difficulty in getting to the remote Bahìa Drake was part of its beauty. Most people go to Bahìa Drake by boat from Sierpe (that’s an adventure in itself! 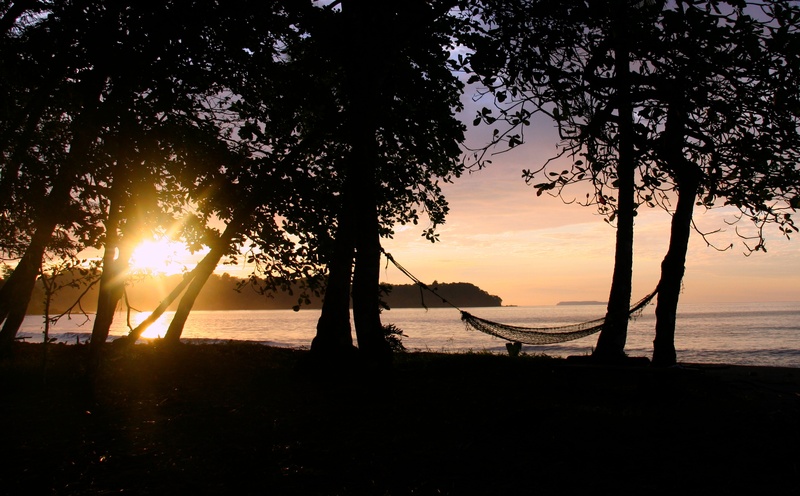 ), because they’re coming from Manuel Antonio, a touristy all-signs-are-in-English beach town up the coast. But I opted to fly directly from San Jose. Only two airlines fly into Bahìa Drake: at $130 US, Sansa (which flies out of a teeny airport a block down the road from Juan Santamaria) was more expensive than NatureAir (which flies out of Pavas International Airport, 16 km from Juan Santamaria International Airport), but I could walk to the airport. It’s a wee plane that flies to Bahìa Drake. 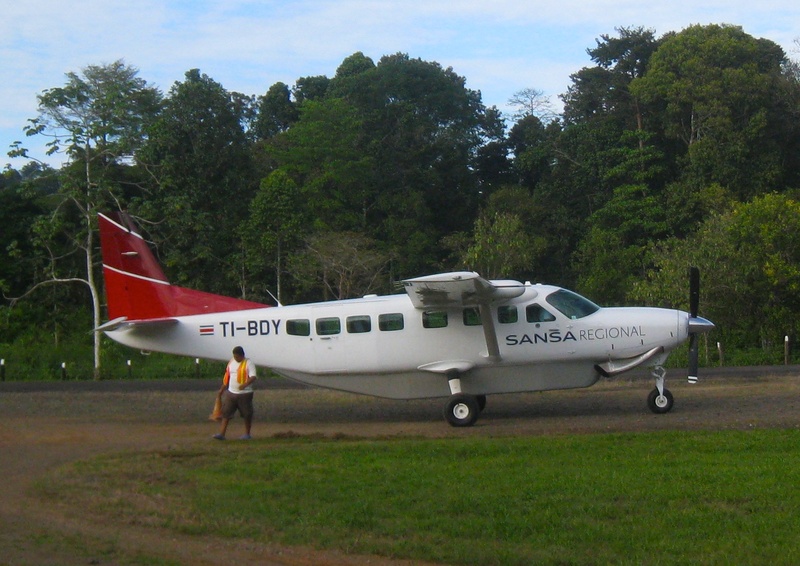 As you can see above, Sansa‘s airplane is like a school bus! I count nine passenger seats. Nine! And I don’t know why they bothered to weigh both me and my bags, because I was the only passenger! 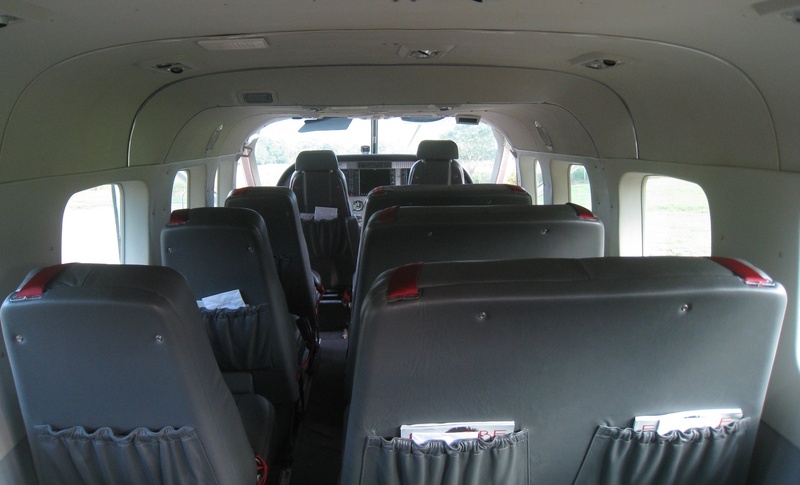 Yes, you read right: I had my own private flight. Needless to say, I sat behind the pilot – one row back, so I could grip the back of the seat in front of me the entire flight. Exciting way to start of my trip indeed! With gorgeous views, natch. I couldn’t stop snapping pics like a little girl. I had to take a shot of us landing. 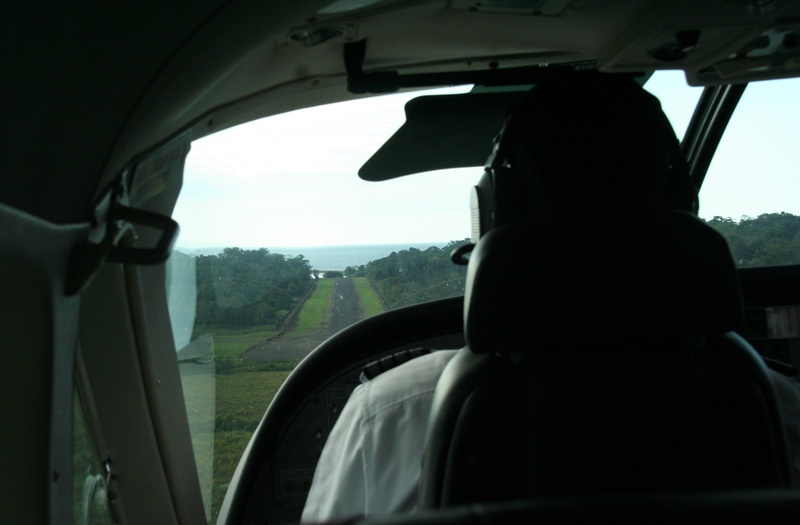 There we were, with the land to our left, flying south, when the pilot (there he is!) turned the plane to the left, bringing us round to face the Pacific Ocean. And down we went. Quickest. Landing. Ever. And freakiest, too, ’cause all I could see – between us and the rapidly approaching ocean (there it is!) – was an itty-bitty strip of grass and dirt in the middle of the jungle (that’s there too!). That was the landing strip! The plane kinda reminded me of the plane from Fantasy Island. And, boy, was I ever relieved to be back on the ground. 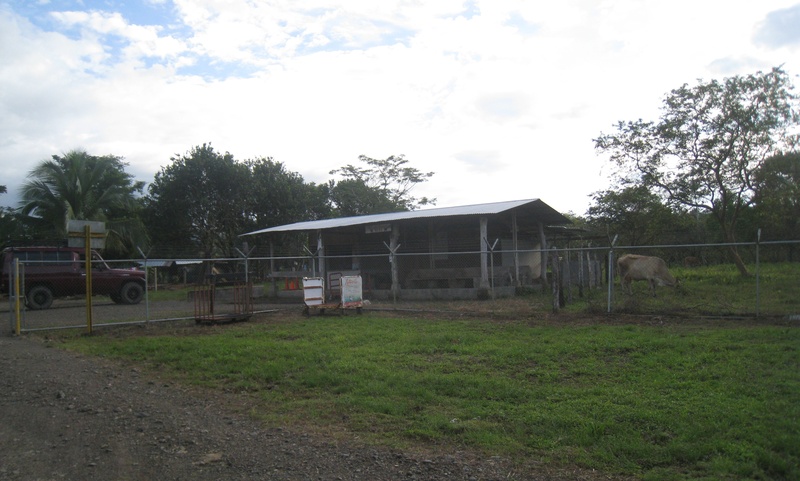 And the Drake airport, well, it consisted of that strip of dirt in the open field in the jungle, some grazing cows and this tiny barn-like building. And the first sign of how undeveloped Bahìa Drake is (aside from the airport): the air traffic controller was wearing slippers! The second sign? There are no proper bridges! There are bridges in the trees for the monkeys to cross the road (true!!! 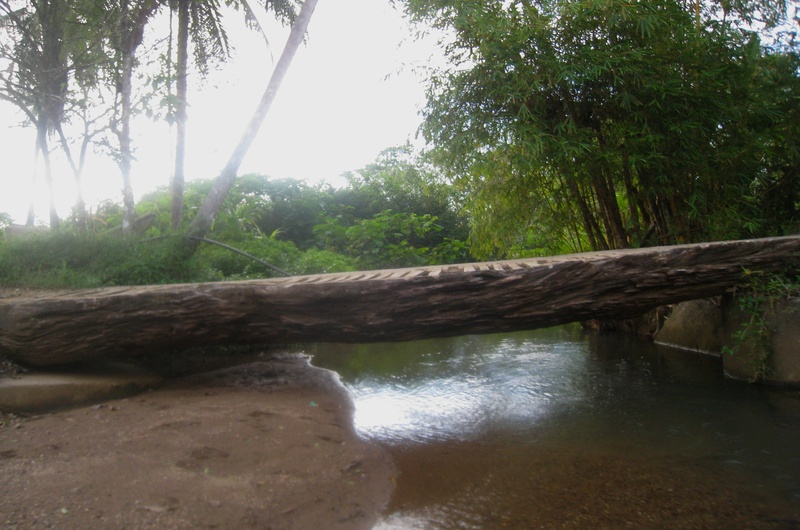 ), but none for people, except makeshift bridges like this modified tree trunk. But none for cars. Really. And after all of the day’s excitement to get there, I enjoyed some delicious fresh pineapple on my arrival, had siesta in my own private bungalow overlooking this beach, swam in the Pacific, watched the gorgeous sunset, and ate a lovely communal meal with a honeymooning couple who had just spent two days and one night with a private guide (who later became my guide on a night tour) in Corcovado National Park. That’s it – we three were the only guests! There’s no nightlife here, aside from the creepy crawlies, so beyond exhausted, I fell asleep around 9 p.m. to the sounds of the waves lapping against the shore. Turns out, one of the highlights of my stay at Pirate Cove was that night tour. Take a peek at the famous red-eyed tree frog and other creatures I saw in the area! Thanks! I volunteered in the cloud forest in Santa Elena and was tempted to walk over to Monteverde to zipline, but, um, I’m afraid of heights. 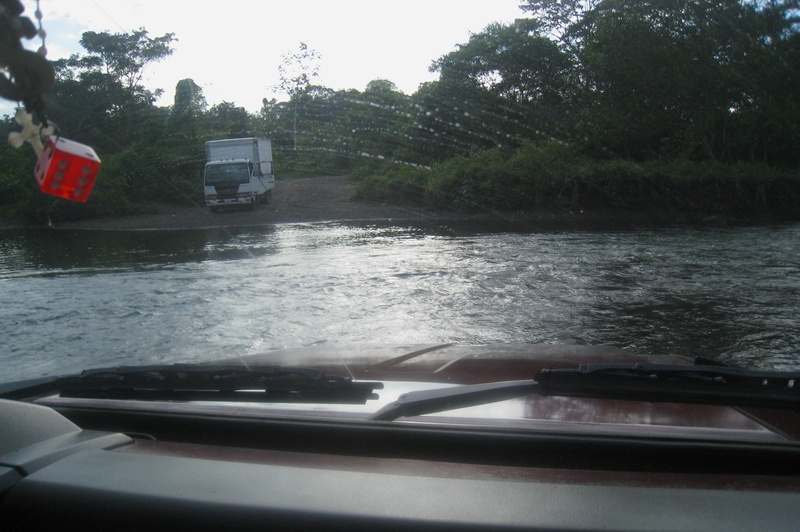 Rio Celeste…next time! Thanks for the reco!